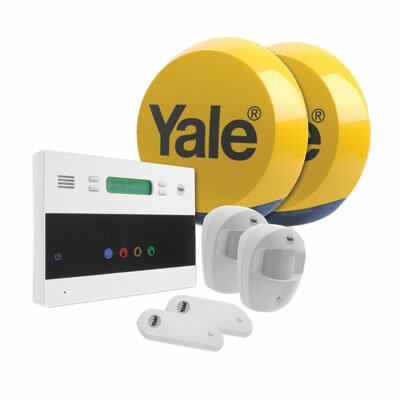 Highest level of security intruder alarm which allows customers to monitor the system on mobile and landline numbers it can even service the system using standard alkaline batteries which are quick and easy to change, with the alarm panel warning you when they need changing long before the system stops working. 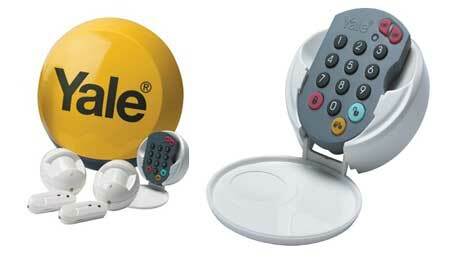 Top-of-the-range house alarm that will alert you by telephone when triggered. 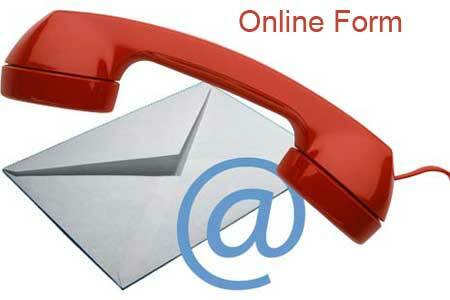 Stores up to six telephone numbers and will call/SMS in a specific sequence. The system can also be remotely activated/deactivated using SMS text messages. Features a digital display that can be tailored to individual requirements. The ability to arm parts of the property whilst disarming others and the length of entry/exit can be customised to meet your needs. 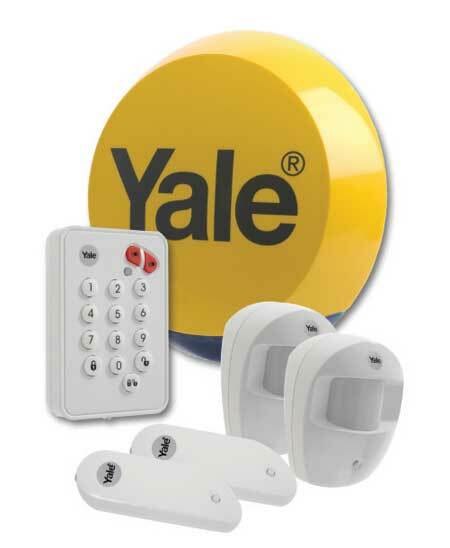 Yale security alarm is giving the top level premium of security with this unit not even needing a wired telephone line , for the autodialler uses the mobile network. This stops even the possibility of intruders trying to disarm your autodialler by cutting the external telephone line, it uses the mobile network just like a mobile phone. Supplied with brackets and lithium batteries. Standard size mobile phone SIM card required (not supplied). Mobile 07813 779273 – E-mail sales@adalarms.co.uk Website. This and inexpensive security alarm systems can contact you by telephone or by text message if the alarm is triggered allowing you to monitor your system on mobile or landline numbers. 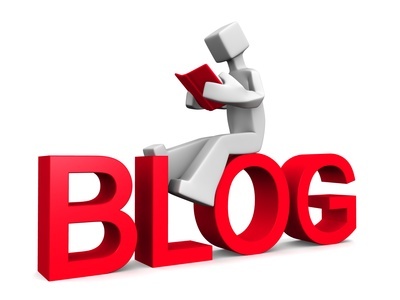 You can program in up to six telephone numbers and the GSM Gateway device uses the mobile network. This gives the added security that there is no way to disarm the autodialler by damaging the external telephone line because, of course, it’s not being used, the autodialler is using the mobile network. You can set the control panel to notify also by text message and it can do this to inform mobile users when the alarm is armed or disarmed or usually set to sending a text message only if the alarm is triggered into an alarm condition. So this comprehensive alarm system gives you full notification of any activity of any kind or just alarm conditions. The system also allows you to control it by text message so you can switch on and off your alarm system and monitor it remotely from your mobile phone. A security tip, if you want to make your system extremely safe is to hide the control panel in a remote location where it could not be found quickly by an intruder and if possible also a short entry time. Another way to achieve added security is to add a wireless keypad into the system so you can keep the entry time a very short by having the second control pad closest to the door, but having the main panel and autodialler further back in the building in a safer location. So summing up the security alarm not only gives the usual audible alarm signal from an external siren box and internal control panel but also gives you a complete monitoring service if you require I text or phone call using the safe and secure mobile network. Total security and total monitoring without any ongoing costs and even the maintenance is easy because the system uses standard alkaline batteries which can be replaced quickly and easily by the end user. 20-Zone Control Panel This and inexpensive security alarm system can contact you by telephone or by text message if the alarm is triggered allowing you to monitor your system on mobile or landline numbers. You can program in up to six telephone numbers and the GSM Gateway device uses the mobile network. This gives the added security that there is no way to disarm the autodialler by damaging the extent telephone line because, of course, it’s not being used, the autodialler is using the mobile network.You can set the control panel to notify also by text message and it can do this to inform mobile users when the alarm is armed or disarmed or usually set to sending a text message only if the alarm is triggered into an alarm condition. 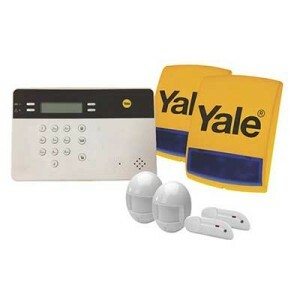 So this comprehensive alarm system gives you full notification of any activity of any kind or just alarm conditions. So summing up the security alarm not only gives the usual audible alarm signal from an external siren box and internal control panel but also gives you a complete monitoring servic by text or phone call using the safe and secure mobile network. 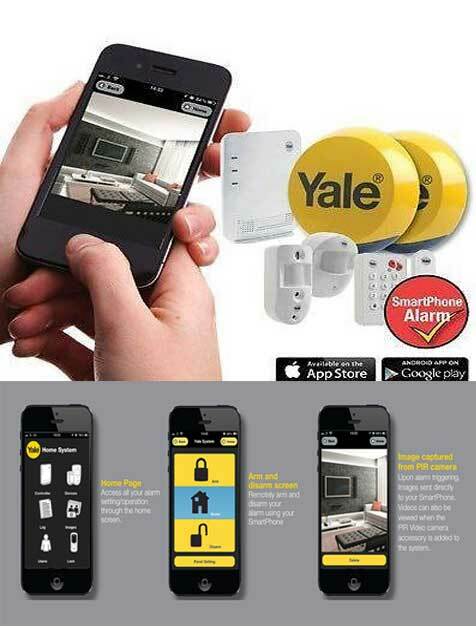 Is possible to monitor and control your alarm from your mobile phone and if you want to make this even easier you can also download the Yale mobile control app and quickly and easily set this up so you can am, disarm and monitor your alarm more quickly and easily from your mobile phone. GSM control panel, siren and strobe, dummy siren box, 2 x PIR movement detectors, 2 x door/window contacts, fixings and batteries.